My hopes for an extended summer road trip taking in many of the farm history sites I've been keeping an eye on didn't quite come to fruition, but I did manage to get to Hancock Shaker Village in Pittsfield, Massachusetts, a place that seems to be especially venturesome in playing with the line between past and present. My colleague and friend Patricia West and I spent a day looking around the village and came away very impressed with the way that HSV has made a case for its present-day farming and renewable-energy generation as entirely authentic to the Shaker history on display here. 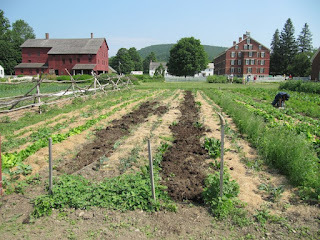 A 3,000-acre farm and village of 300 people in the 1830s, the Hancock settlement shrank, like all Shaker communities, in the later 19th and early 20th centuries. In 1960, the few remaining members sold the property to preservationists. 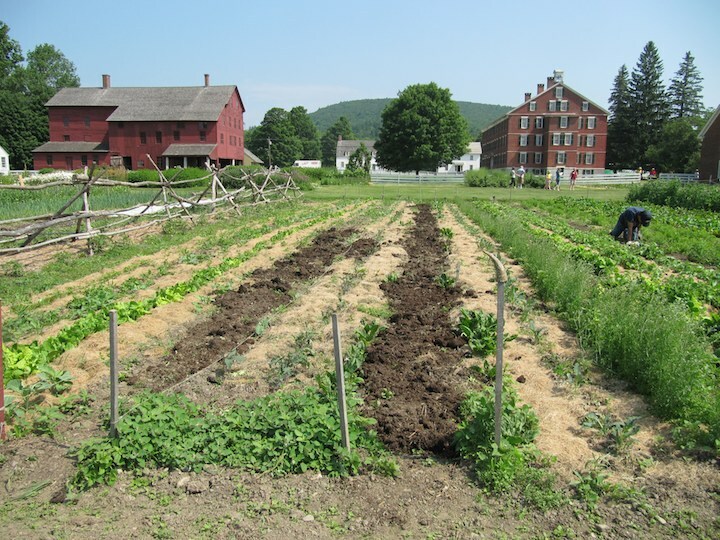 The village reopened as a museum in 1961, on the cusp of an expansive moment in living history that saw the creation of many such farms and villages around the U.S. The popularity of the Shaker aesthetic among collectors and decorators made this site, like nearby Historic Deerfield, upscale rather than rustic, and my sense is that the viewing and buying of Shaker-inspired crafts and furniture has always been a big part of its appeal for visitors. 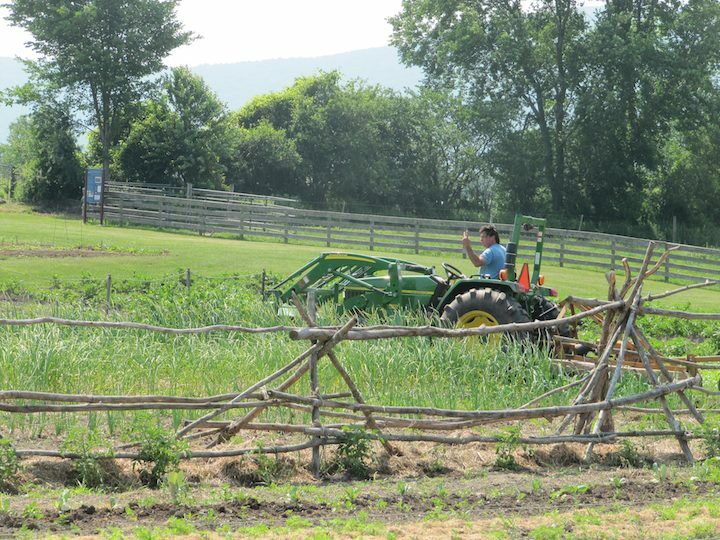 Hancock Shaker Village is a center for exploring what it means to live a principled life in the 21st century. Part of that process is to understand the impact of energy consumption on our selves, our community, and our world. 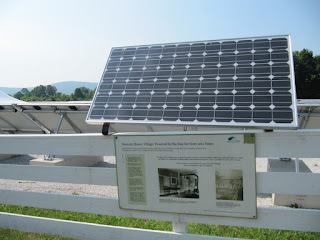 We at Hancock Shaker Village look to the Shakers' use of water, wind and other renewable energy sources as an inspiration for how we run the Village today... [A]ll season long we incorporate this modern renewable energy and sustainable agriculture initiative into our daily and seasonal programming – helping to bridge the gap between past, present, and the potential for the future. It's true that the innovative and iconoclastic Shakers provide particularly good raw material for this approach. But it also requires present-day management that is not afraid of creating jarring juxtapositions within the kinds of of landscapes and practices we expect at historic sites. I've heard preservationists deplore the way that the location of the 450 PV panels--right at the main entrance to the complex--interrupts the historic landscape, but that's clearly the point: not to hide a modern "intrusion," but to foreground it as a living example of how the historic site sees itself as following the Shaker ethos. This year, some air conditioning was added to the Shakers' original root cellar in order to give the CSA more flexibility in how it harvests and packages food for shareholders to pick up. Neither of these things is authentic to the literal landscape and technology of the 19th century, but they support what I see as a more sophisticated vision of authenticity that takes into serious consideration the meanings that the Shakers invested in this site as well as its buildings and their contents. As I say, these additions don't represent a radical shift away from HSV's tried-and-true interpretation. Its annual fall Country Fair and wildly popular Baby Animals event in the spring in no way challenge the conventional emphasis on the aesthetic qualities of this lovely New England place. The fair is heavy on high-end handcrafts and the spring event reinforces the association of small-scale, "old-tyme" farming with the childlike, the nostalgic, the cute and fluffy, something I've tended to see as one of the more insidious strategies that historic farm sites adopt in order to attract an audience. But the sheer numbers that HSV manages to pull in in this way--15,000 for the 2012 Baby Animals--make me less dismissive. Out of that considerable crowd there are bound to be a substantial number of people who notice the PV panels and the working farm fields and who perhaps inquire about the CSA or leave with a sense that there's something unexpectedly vigorous and forward-looking happening at this beautiful historic site. Over time, those oddly-juxtaposed elements--the cutesy and the experimental--may support a lasting shift into more consequential food and energy production, a circuitous route back (or forward) into a different and more interesting kind of authenticity.